As you may have learned over the years here at Slowly-by-Slowly, one of the Ottoman-era puppets who inhabits my brain (with the goal of assisting me in my cross-cultural marital road trip) is Mercan Bey ( that’s “Mehr-jahn”), the Arabian Spice Trader Puppet. You can read a bit more about him by clicking right here. Now, Mercan Bey has travelled near and far – and always sniffs out the most delicious grocery items, spices and places to eat. He is, therefore, closely related in some spiritual sense, to M., who with only about a 1% fail rate, always chooses the best places to enjoy breakfast, lunch or supper. Unfortunately, I used to think that I too have this gift, but given my 99% fail rate, pointed out to me by Mercan Bey, I have given up and given in to the whims of M. and Mercan Bey on the food-locating front when outside of the home. Both Mercan Bey and M. shouted “Eureka!” at the same time. Now, while some of you know that this was the term that gold-panners called out upon finding their lump of ore, in my life, this means “We’ve found the right place to eat – and we’re going right now! !” Of course, this set all the puppets into a riotous spin of activity – mainly involving the tying of napkins around their necks and the like…before even knowing where we were going. And as the car careened to the right towards a dirt path through an orange grove, then I saw it, the simple wooden sign, with green letters, saying “farm house” or “Çiftlik Evi,” in Turkish. And after several miles of twists and turns through red-dirt farmland, waxy green citrus tree leaves and a small village with very narrow roads, we emerged into the parking lot of the proprietor Mustafa Bey’s farm house restaurant. Kenne, the Queen of Manners and Etiquette for Ladies reminds me that I must remind those of you who do not know that in Turkey, last names are often not used, especially in the countryside, so everone is Mr. Mustafa (Mustafa Bey) or Liz Hanim (Mrs. Liz). And if one is trying to be very proper and respectful, it becomes Mustafa Bey Efendi (sort of “Mr. Mustafa, Sir”). OK, Kenne is satisfied and will leave me alone to type my own post now. Born in Gaziveren, Mustafa Bey and his family left for Leicester, England, circa 1974 (the historical line-in-the sand that seems etched into the hearts and minds of all Cypriots we met). Schooled and raised in England, Mustafa Bey married, had three girls – and now has a granddaughter as well. His lifelong dream has been to return to this village, and to open a farm-to-table restaurant…and while he is clearly thrilled to be doing what he does, he was kind enough to share that it is a challenge when one’s daughters and granddaughter are so far away…not to mention a challenge given the tenuous economic situation in Northern Cyprus (i.e. not able to trade with other countries -legally- given that the country is not recognized). Regardless of these worries, we continued our “eat across Cyprus” theme and gorged ourselves on the best of the farm – all of which was the most fresh tasting (and smelling) food either of us have ever eaten. From the meze of plain yogurt with mint, local olives, pickled vegetables and a nutty hummus (not often seen in our locales in Turkey – more of an Arab thing – but there it was on the Cypriot table) to the whole, gluten-rich wheat bread with ayran (salty yogurt drink), we shone with food happiness and the puppets rolled around the table in fits of glee. Karagoz himself just rolled around in ecstasy as he was rubbing his tummy as lamb-jus spilled out of the corners of his mouth. Our salad included vegetables that SMELLED like vegetables and our entree, which Mustafa Bey introduced as “what the Greeks call Kleftiko” was a heavenly slow-cooked lamb shank with rosemary-baked potato wedges. 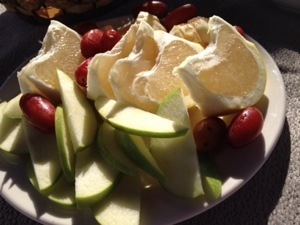 Dessert was a plate of the freshes grapefruit, apple and new dates. It was all we could do not to fall down on the lawn of the restaurant and take a nap. Luckily, Mustafa Bey pointed us in the direction of his nephew’s small hotel in exactly the most western town in Northern Cyprus – and we headed off for a nap. More on that later! This entry was posted in Puppets on the move around the world, Turkish Food!, Visits from the Karagöz puppets and tagged Cyprus, farm to table, food, fresh food, Gaziveren Cyprus, Kibris, Kuzey Kıbrıs, Northern Cyprus, organic, Turkish, Turkish Cypriot. Bookmark the permalink. I’m SURE he will be. Oy, chug-a-lug! I used to do that once upon a time. 🙂 Can’t wait!!! !